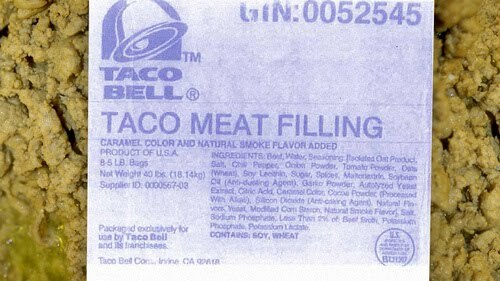 GhettoFob.com: This Is What Really Hides In Taco Bell's "Beef"
Beef, water, isolated oat product, salt, chili pepper, onion powder, tomato powder, oats (wheat), soy lecithin, sugar, spices, maltodextrin (a polysaccharide that is absorbed as glucose), soybean oil (anti-dusting agent), garlic powder, autolyzed yeast extract, citric acid, caramel color, cocoa powder, silicon dioxide (anti-caking agent), natural flavors, yeast, modified corn starch, natural smoke flavor, salt, sodium phosphate, less than 2% of beef broth, potassium phosphate, and potassium lactate. It looks bad but passable... until you learn that—according to the Alabama law firm suing Taco Bell—only 36% of that is beef. Thirty-six percent. The other 64% is mostly tasteless fibers, various industrial additives and some flavoring and coloring. Everything is processed into a mass that actually looks like beef, and packed into big containers labeled as "taco meat filling." These containers get shipped to Taco Bell's outlets and cooked into something that looks like beef, is called beef and is advertised as beef by the fast food chain. Can you call beef something that looks like ground beef but it's 64% lots-of-other-stuff? Taco Bell thinks they can.